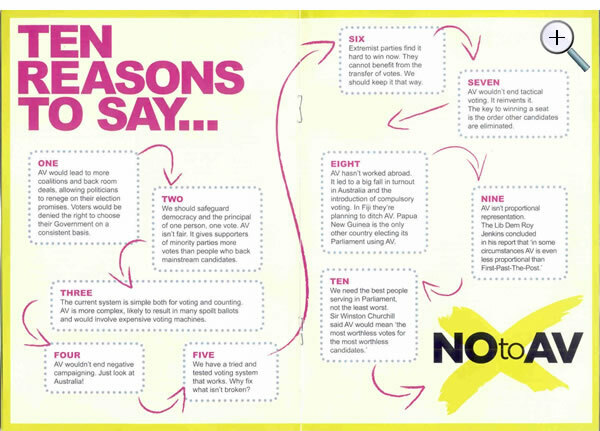 The Labour No campaign has recently published an 8-page leaflet containing 10 reasons to say No to AV. Left Foot Forward examines each point in turn. The Labour No campaign has recently published an 8-page leaflet which is being distributed around the country. 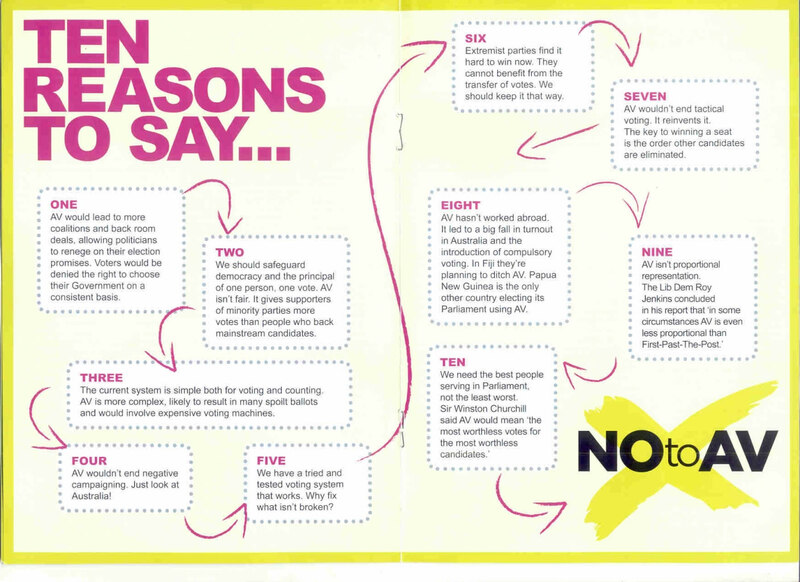 The centre-piece of the leaflet, which does not contain a single positive reason for retaining first-past-the-post, claims to provide “Ten reasons to say … No to AV“. Left Foot Forward examines each point in turn. Claim 1: AV would lead to more coalitions and back room deals, allowing politicians to renege on their election promises. Voters would be denied the right to choose their Government on a consistent basis. The truth: Hung parliaments are no more likely with AV. Australia, which uses AV, has had only two hung parliaments in 90 years compared to four over the same period in the UK. Equally Canada which uses FPTP has had three successive hung parliaments since 2004. As the recent election showed, First Past the Post has not given Britain any special immunity to hung parliaments. Going into the election, the Tories needed to win just 24 seats to cause a hung parliament but 115 seats to win an overall majority. Going into the next election if FPTP is retained (and ignoring the impact of boundary changes), Labour would have to win the equivalent of 67 seats to win an overall majority. Any swing lower than that (or even a modest swing to the Tories that resulted in fewer than the equivalent of 19 seats being won) would result in another hung parliament. Claim 2: We should safeguard democracy and the principal of one person, one vote. AV isn’t fair. It gives supporters of minority parties more votes than people who back mainstream candidates. The truth: With AV everyone gets one vote. The difference is that with AV gives you a vote that really counts and more of a say on who your local MP is. If your first choice gets knocked out your vote is transferred to your second preference. But regardless of whether you just vote ‘1’ for your favourite candidate or list a preference for every candidate on the ballot, only one vote will be counted. If you go to the pub and order a pint of Carling but they are out of Carling and you choose a pint of John Smith’s instead, you’ve still only had one pint. Claim 3: The current system is simple both for voting and counting. AV is more complex, likely to result in many spoilt ballots and would involve expensive voting machines. The truth: AV couldn’t be simpler. In fact it’s as easy as ‘1,2,3…’. People will be able to pick the person they really want but will also have the chance to pick second and third choices if their first choice doesn’t win. And if you only want to vote for one candidate, you can still do so. There are no plans to introduce new voting machines. Claim 4: AV wouldn’t end negative campaigning. Just look at Australia! The truth: AV rewards candidates who reach out to the widest possible number of voters. Candidates can, of course, still choose to go negative but as they can no longer rely on mobilising only their core vote it is less likely to be a winning strategy. A good example of the impact of AV on campaigning is Mary Robinson’s election as President of Ireland. Brian Lenihan, the Fianna Fáil candidate, was expected to win but Robinson won on second preferences after conducting a 3-month tour of Ireland meeting people, listening to their concerns, and setting out how she wanted to revitalise the Presidency. Robinson was also helped by an attempt to smear her by Padraig Flynn, a senior Fianna Fail politician, who accused her of “having a new-found interest in her family“. This drew the ire of women and unaligned voters, and cemented Robinson’s support base. Claim 5: We have a tried and tested voting system that works. Why fix what isn’t broken? The truth: FPTP is a broken electoral system. First, general elections are increasingly decided by small numbers of people in marginal seats. Research by the Institute for Public Policy Research shows that just 460,000 voters decided the last election. Second, the number of safe seats is increasing. Mark Pack has shown that half of all seats in England have been held by the same party since 1970. Third, the number of MPs getting elected without majority support is increasing. In 2005 and again in 2010, two-thirds of MPs returned to Westminster did not have majority support from local voters and some were elected with as little as 30 per cent of the vote. Claim 6: Extremist parties find it hard to win now. They cannot benefit from the transfer of votes. We should keep it that way. Because FPTP enables candidates to win with a relatively small percentage of the vote, extremist parties such as the British National Party have more chance of being elected under FPTP despite most people in an area opposing them. It is little surprise, therefore, that the BNP are campaigning against AV. Claim 7: AV wouldn’t end tactical voting. It reinvents it. The key to winning a seat is the order other candidates are eliminated. The truth: With AV there is no more need to vote tactically. Instead, you can pick the candidate you really want to win. Under FPTP voters often have to face the choice of having to abandon the party they actually support, to prevent the party they least support getting in. AV eliminates the need to vote tactically in this way because people can rank their candidates in order of preference. Claim 8: AV hasn’t worked abroad. It led to a big fall in turnout in Australia and the introduction of compulsory voting. In Fiji they’re planning to ditch AV. Papua Guinea is the only other country electing its Parliament using AV. The truth: Approximately 14 million people in the UK already have experience of using AV in civic society elections. It is used by teachers, journalists, nurses and lawyers in their internal elections as well as by organisations such as the Royal British Legion, the Telegraph media group, and News International. The Labour party already uses AV for its leadership elections while a similar ‘preferential voting’ system is used for Conservative party leadership elections. AV was first used in Australia in the 1919 election when turnout was 72 per cent, the highest it had been so far that century. It did, indeed, fall in the subsequent election but two data points rarely prove anything. This brilliant blog from Lee Griffin (aka @niaccurishi) explains the background in much, much more detail. Claim 9: AV isn’t proportional representation. The Lib Dem Roy Jenkins concluded in his report that ‘in some circumstances AV is even less proportional than First-Past-The-Post’. The truth: This is probably the only accurate claim in the entire leaflet. Much to the chagrin of PR purists like David Owen, AV isn’t and doesn’t claim to be PR. Instead, AV is a natural, sensible and small change to strengthen our current electoral system, not abandon it. It preserves its best features – the constituency link and decisive election results – but updates it to give voters more of a say, and ensure MPs have to reach out to over 50 per cent of their local voters. Claim 10: We need the best people serving in Parliament, not the least worst. Sir Winston Churchill said AV would mean ‘the most worthless votes for the most worthless candidates’. In a pure two-party system like the US, or the UK from the 1950s to 1970s, FPTP might well be a superior system. But when a third of people vote for a third party and 1-in-10 vote for one a party outside the ‘Big 3’, a different system is needed. AV is the right voting system for Britain today.